The high standard of the Chapel music at St John's College Cambridge has long been one of the yardsticks by which other musicians and choirs are measured. However, over the years, it became increasingly obvious that the organ was no longer able to contribute effectively. The music at St John's College Cambridge is extremely varied, and the demands made on the Chapel organ no less so. First and foremost, it is essential that the instrument can accompany an unusually wide range of liturgical music as authentically as possible. Second, it has to balance the choir over an unusually wide dynamic range. At the same time, it is equally essential that the organ is an outstanding recital instrument and one that can inspire organ students, as every good teaching instrument should. 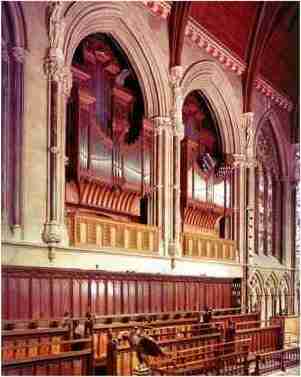 All these requirements were taken into consideration when the new organ for St John's College was designed. 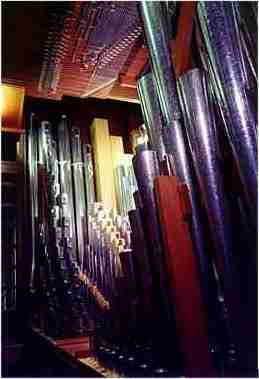 Apart from a handful of pipework on the Pedal Organ and the two strings of the Swell Organ, all the pipework is new. The interesting cases designed by J Oldrid Scott were modified slightly both to improve their overall appearance and to allow them to project a little further into the Chapel itself. 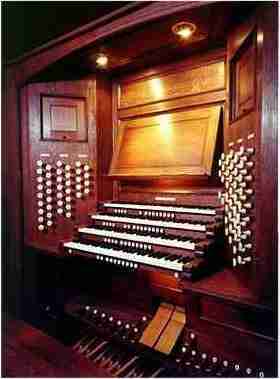 The inspiration behind the tonal conception of the instrument was the English organ of the mid-nineteenth century. This was developed in order to provide a flexible and versatile instrument capable of a musical rendering of a large part of the organ repertoire. The key action is mechanical and suspended, and the drawstop action is also mechanical but fitted with heavy-duty solenoids to allow the inclusion of a comprehensive capture system. Since its completion, this instrument has been used for a number of recordings, both in accompanying the world famous choir of St John's College and also as a solo instrument. Many people will know this instrument from the traditional annual broadcast of the Advent Carol Service from St John's.